Birthday Baby & A Giveaway! Today is the day...I'm officially in the last year of my twenties! Twenty Eight was such a crazy year - we got engaged, got married, moved to Maine, sold a house, bought a house...you know, just a typical year - that I can't even begin to fathom what Twenty Nine has in store. If I were making my Wish List for my 29th year, I would include travel with my Husband that is non-wedding related (I love weddings, but we're a bit burned out after pulling multiple seasons in a row with 9+ weddings each), for Newlyweds:North to continue to grow and inspire me, for us to survive our first Maine winter, that my chin doesn't end up looking like Mama June's and for Justin to continue to be happy in his new Maine job (I'm a nice wife to include him in my Wish List!). But despite all those noble and selfless wishes, do ya'll wanna know what would be the best gift of all (besides a new DSLR camera, Louis Vuitton or Mexico)? If you would join us here at Newlyweds:North! It's so easy, should take a grand total of 15 seconds and would be the most perfect birthday gift ever! All you have to do is click on the right side of this very blog page - where it says "Lovely Followers" - and do exactly what the prompts tell you to do. Or, if you're more of a Bloglovin' kinda girl (or guy, hey ya'll! ), then follow me there! If your pretty pic is already showing, then I thank you bunches for the love! And because I really do love Birthdays (just not mine), I thought I would do something super fun just for ya'll! so, I thought it would be perfect for my First Giveaway! The hat will be just like mine, complete with your sweet monogram. It really is the most perfect Honeymoon/Island/Beach/Derby/Football/Just Need To Look Fabulous accessory and I know ya'll will love it as much as I do! My Birthday Giveaway is sponsored by my dear friends at The Pink Azalea. Ya'll, if you are ever in Greenville, SC you must run/drive and park as close as you can (not walk) to Pink Azalea. Not only is it in the cutest downtown location, but the Pink Azalea girls are the sweetest. Best of all, they're ready and waiting to monogram just about anything that will sit still. Pink Azalea came to the rescue and monogrammed the sashes for my Bridesmaid's Getting Ready Rompers and their fab cover up can be spotted in my Anguilla Day Honeymoon post. Not planning to sweat your fanny off anytime soon in lovely South Carolina? The Pink Azalea has the best website and a fabulous Facebook page. The Birthday Giveaway will be open for my entire Birthday Week (Birthdays should def be celebrated for longer than 24 hours, don't ya'll think?) and I'll announce the winner next Monday morning. I'm already a follower but HAPPY BIRTHDAY! 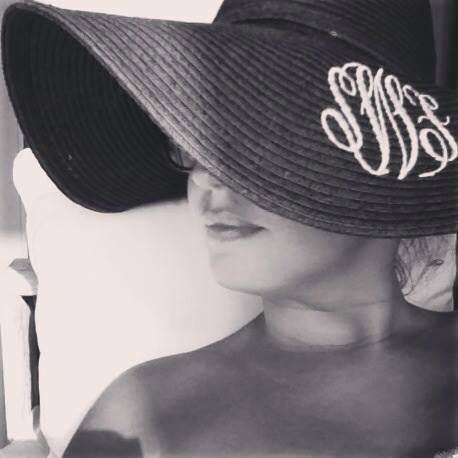 :) Love the monogram hat! I'm equally obsessed with monograms, and they are everywhere here in SC! I'd love to wear this on the beach!